Our amazing staff gets the party started! We bring the fun to your location! Glitzy Girlz is a unique party planning entertainment company catering to ages 4-12 years of age. Although we love girls, we can add boys to make a party or event co-ed as well. We bring our parties/events to YOUR home or place where you are hosting the event. We do not have a storefront and conveniently set up the event at your front door! Our company is owned by a creative dynamo, Lisa DiMaggio in 2001. My creative vision was for young girls (and boys even) to be entertained in their own home with all the things they LOVE- glam, crafts, jewelry, music, dancing singing and friends! We give busy moms or "creatively challenged" with help in making their daughters visions for her birthday come true. Glitzy Girlz is unique because we implement all these elements in one party experience instead of separate themes. We have outlasted over a decade of party companies and that is why you should hire us! We know how to get the party started! 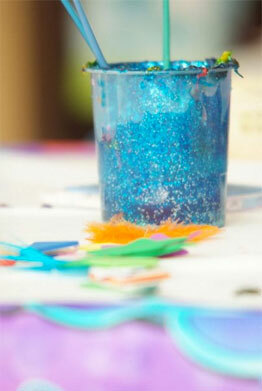 Are you looking for a Fun and Creative idea in your home residence or rented location for a birthday party? Glitzy Girlz is a unique party planning entertainment company for ages 4-11 years old. We bring the services where you are hosting your event and set-up onsite at YOUR location! We cater to girl events, but can arrange COED and Parent/ Child functions. Browse our different event opportunities and contact us with specifics about your upcoming event. Glitzy Girlz runs one day special event classes at almost 40 park districts in the Chicagoland area. Sign up your girls and her friends at one of great classes offered this season! is required for all party locations over 5 miles from home office in Rolling Meadows, IL Locations 0-5 miles are free with no charge. All locations 6-40 miles will be additional travel charge. We are a traveling service and my staff is paid by distance along with other factors. We consider this crucial to our business and your understanding is much appreciated. Our pricing increases with mileage: Feel free to use our link to www.mapquest.com to calculate your charge. The best part of hiring Glitzy Girlz was their amazing staff. I originated Glitzy Girlz in 2001 when I had a my first child. I look at my journey this company has brought and I feel blessed. I am very proud of the growth and the potential for the future. I believe in the personal touch and that is why you still still get me on the phone or even have me as your hostess. I am always looking forward to meeting new customers and revisiting old ones. Glitzy Girlz has run three of my daughter's parties and each one has been a blast for her and her friends. The parties are very well run and tons of fun. I like that Glitzy Girlz runs the party and I can sit back and enjoy the party as well. I would highly recommend Glitzy Girlz for birthday parties. Lisa and her company are a top notch business that pride themselves on getting into the mind set of young girls. She is so personal able and respectful of your family and home. I think she is the most creative young woman! My daughter and her friends still talk about her party. They loved getting their hair, make-up and nails done. They were busy the whole time. I have recommended this party to all my friends and would have no problem hiring them again. It was nice to have a party at home and keep the girls entertained. My daughter's Rock Star party was a blast! Glitzy Girlz kept 18 girls entertained with crafts, jewelry, dancing and a rock star make-over. The kids loved it and did not want the party to end. Glitzy Girlz arrived early to set-up and cleaned up afterwards. I couldn't have done it without them. You did an amazing job with my daughter Hope's birthday in May. It far exceeded my expectations as to the quality of the items and your fabulous job running the party. We LOVE Glitzy Girlz! They do EVERYTHING from set-up, clean-up and make the most "stress-free" party I have ever hosted. I would definetly use Glitzy Girlz again and again! You guys did a fantastic job of keeping 21 boys and girls engaged and interested in an hour long party. They loved the treasure hunt and finding the box at the end. The wood treasure box craft was creative and the beading project was great with the boys and girl style beads for everyone. It is hard to find a party that fit the needs of girls and boys with each enjoying it equally. We had Glitzy Girlz provide a Rock Star Party for my daughter's 10th birthday-what a hit!The two crafts kept them entertained while the Glitzy Girlz did their Rock Star make-overs with very cool hair extentions. The Glitzy Girlz led them in several fun dances in our disco basement. The best part for me-I got to enjoy the party while the Glitzy Girlz representative did the work. She was on-time, completely prepared and fun for the girls while being professional for me. Absolutely perfect!" 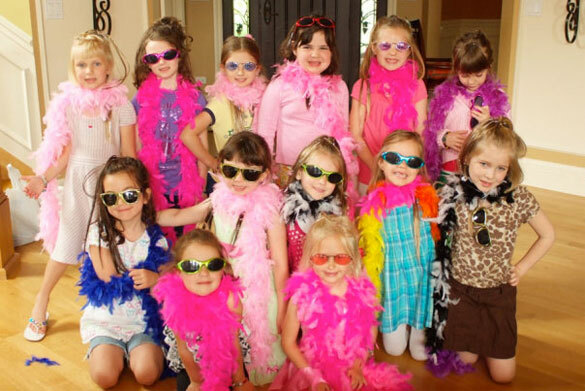 Our Girl Scout troop hired Glitzy Girlz for our end of the year party. It was fantastic. They were organized, engaging and so much fun! The activities were useful and the beads were gorgeous. The fact that we had 21 girls entertained without our help was super. Our school has passed their name around and will use them for years to come. The Glitzy Girlz are a great find for party entertainment. They provide fun activity, young staff and party extras. I ordered the Custom Invites and Glam Goodie bags for the party favors. The easiest party I ever planned and most importantly, a great price for EVERYTHING! Winter is coming..What can I do for a birthday party? Why Should You Have A Party In Your Home?